The mining industry, particularly the companies servicing major miners, has finally navigated what appeared to be an extremely severe downturn in metal prices. Many mining services providers were forced to shut down operations and go to the banks to stay afloat. The sharp price downturn sent shockwaves across the sector and it took a combination of prudence, frugality and quality of deliverance to ensure a future beyond the downcycle. RUC Cementation Mining, managed by managing director Barry Upton, did exactly that. Having guided the company through the worst times in mid-2014 the underground miner is now set to embark on a period of 35% growth year-on-year until 2020. 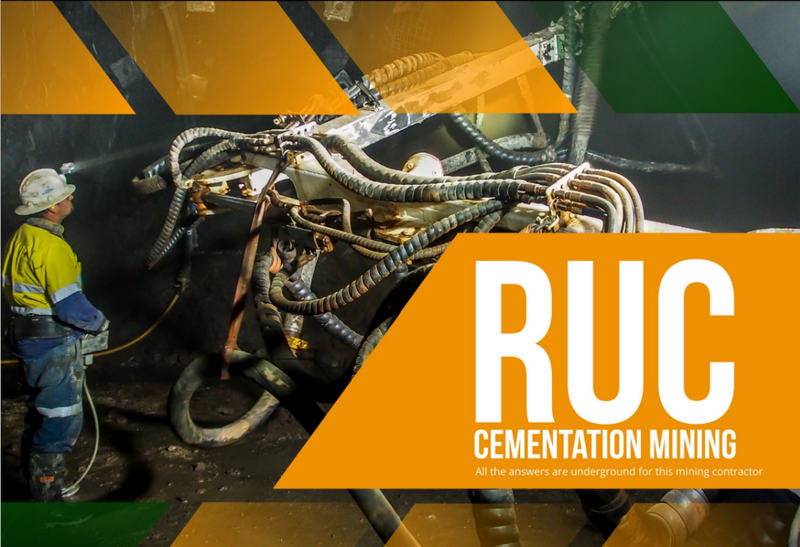 RUC is a diversified Australian underground mining contractor which provides turnkey underground solutions including; raise drilling, shaft sinking, underground construction, mechanised mining, and specialist ground support. Upton says the company is a full service, full supply, self-performing contractor. The private company has an extensive project portfolio which spans Australia and several countries across the Asia-Pacific region. RUC has established a reputation for excellence in the delivery of its work, ensuring complex projects are completed on time, within budget and taking responsibility to make sure the work is of the highest quality. However, this reputation did not come about overnight, RUC first came to Australia in 1991 and has spent the last 26 years building its profile. Upton joined the company in 2006 with the specific ambition to expand the company’s offering into mechanised mining. RUC continued to pick up contracts with a number of the big players in WA for a variety of projects and then in 2009 it entered an exclusive arrangement to sub-contract to Gammon Construction on a civil construction project in Hong Kong and that was the birth of the major international expansion of RUC Mining. It wasn’t long until operations had spread to Mongolia by 2010 and then by the end of that year RUC had been contracted to work for one of the world’s biggest mining companies Freeport McMoRan, through their subsidiary PT Freeport Indonesia at the Grasberg complex in Papua. Having picked up some raise boring work with Freeport, RUC then bid on the tender Freeport issued for a turnkey project to excavate, equip and construct the Grasberg block cave service shaft – playing a major role in production at one of the world’s true super mines. RUC’s involvement at Grasberg continued to grow and the company now operates with more than 650 employees on the books with Freeport. In the meantime, it was not all plain sailing. With many parts of the business going well, RUC’s order books were torn to shreds when the commodity price downturn began to bite. Upton says that at the lowest point in mid-2014 turnover fell to just $2.5 million one month. That was when the business reorganised, rebranded and began to lay the foundations for the prospering mining contractor we see today. “At the low point of our business in July 2014 we did a number of things; we reorganised our overheads and our business structure, we established a head office in Perth and unfortunately there were a lot of redundancies,” observes Upton. RUC was able to do that thanks to the portfolio of work it had built up with Freeport – it had a strong story to tell and to sell. At this time there were two major turning points for the company. Firstly it won a jumbo development contract with Panoramic Resources at its Savannah mine and shortly after Saracen Mineral Resources contracted RUC to undertake work on the Karari underground operation at its Carosue Dam mine. Those two projects as well as the continued work at Freeport really brought RUC back from the precipice of mid-2014, culminating in the recent announcement of winning a $200 million contract to carry out underground mining at Dacian Gold’s Mt Morgans project in WA. “On the grounds of those two projects principally we then elevated ourselves to a $132 million turnover for FY2016. I suppose the fact is that the work we were doing at Karari became our advertising point and innovation point of reference for all the other work we have tried to win,” explains Upton. With Upton’s mantra that without anything on the order book you can’t survive, the Dacian contract will underpin the business for the next three years. Upton can now maintain capability and capacity and will continue to drive productivity through engaging with innovative solutions and new ideas on the Dacian contract. His target is to achieve 35% year-on-year growth for the next four years based on the work that is either secured or on the horizon, not accounting for any organic growth in that time. That trajectory would be a continuation of the increase in revenue RUC has experienced since posting revenue of $78 million in FY2014. The following year it increased to $88 million, in FY2016 revenue hit $132 million with Upton expecting FY2017 to reach $170 million. The Mt Morgans contract will play a crucial role in achieving those numbers this year and going forward. RUC mobilised on the project rapidly, signing the letter of intent on April 10 and by May 28 had achieved 95m advance. The very nature of RUC Mining’s work comes with a number of risks that have to be managed to make sure all the employees go back to their families each night and also so the company can maintain its commitment to quality of service. Firstly, the physical risk of working with heavy machinery and on hazardous underground projects is taken with the utmost care. RUC adopts the same rules and procedures if it is working locally in WA or further afield in Indonesia and Mongolia. Then there is the commercial risk to the business of taking on a new contract. RUC typically operates on a cost reimbursable basis internationally where the company is incentivised for performance over and above a base fee, but the entirety of the domestic work portfolio is on a full schedule of rates basis. Working on a cost reimbursable basis however brings a reputational risk, Upton says you have to adopt the approach and philosophy that it is still a fixed price contract and to do that through superior performance. RUC has proven its ability to provide the highest quality service highlighted in the fact it has never resorted to litigation or had a case brought against it in the 25 years in Australia. RUC Mining’s reputation is something the company has concentrated on building up throughout its existence and it transcends all areas of the business. “The most important aspect of our business is the quality of the work we do. Quality lasts forever, we have a saying ‘the bitterness of low quality remains long after the sweetness of low pricing has gone’,” Upton says. “We don’t plan to be a low cost, low margin business we plan to be a high performance, high, quality, reasonable margin business and if we make a higher margin based on our performance that’s what it’s about because then everybody wins. Upton has championed the cause of innovation at the projects RUC Mining is working on, he sees an opportunity to differentiate the company in the market it has, turning out to be transformative for the industry in some cases. RUC has invested heavily in digitising whole of mine and whole of fleet tracking for the Karari operations which gives the contractor full real-time visibility of all the underground assets and Upton says it is the first project in the world to do that in a 3D environment. “We pushed the limits in terms of engaging new technology. The whole Minetec proposition was done on our back, sometimes you don’t want to be first but in this case we are and we think that has created a step change in the operating environment,” asserts Upton. “As part of the Minetec proposition we are now at the point where we are doing task allocations directly to the plant item throughout the shift where the operators can log the task and we get instantaneous reporting. Overall that could be a 10-12% productivity gain. Referring to Upton’s focus on quality over cost, the companies in RUC’s supply chain are a clear example. In terms of large equipment suppliers, RUC uses the major players in the industry such as Atlas Copco, Westrac, Sandvik, JCB and Normet and Upton takes into account reliability, performance and technological advancements on offer for each company. In addition, the support of companies such as Silverise, Westland Autos and Fero Group is crucial in various areas of operation. RUC’s nature as a 365, 24/7 business means the reliability of the service is paramount. Upton says that is what he looks for first, in return RUC will show loyalty and commitment to its suppliers on a long term basis which can in turn lead to priority service during breakdown situations where a provider may have a conflicting demand.